I soaked in the sounds of the morning drifting in past the darkened stained glass. The shuffling of feet and the turning of pages in a Bible were the background music of my prayers. In the early morning of the monastery I sat next to monks and retreatants with heads bowed while my pen flew over the page, recording my prayers in the journal that lay open in my lap. This glorious scene, the perfect time and place to meet with God, happened over a year ago at a rare weekend retreat at a monastery. I had two whole days to do nothing but journal, pray, seek God. That was the last time the stars have aligned in such perfection. Usually, the scene is more like this – I catch a few minutes while the kids are eating breakfast to read a devotional app on my phone. 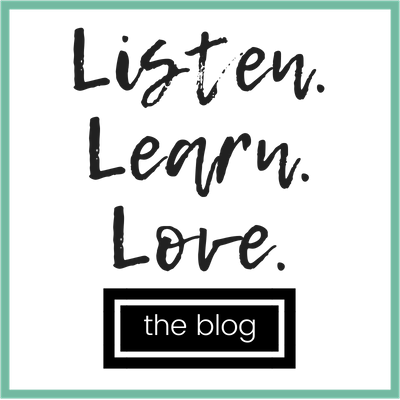 I hear God’s voice speaking to me through the blog of a woman I have read many times before but never realized she was so much like me until her words leap off of the screen at me that day. I pray with the kids over dinner and choke back tears at the sweet, sincere prayers of an innocent six year old. 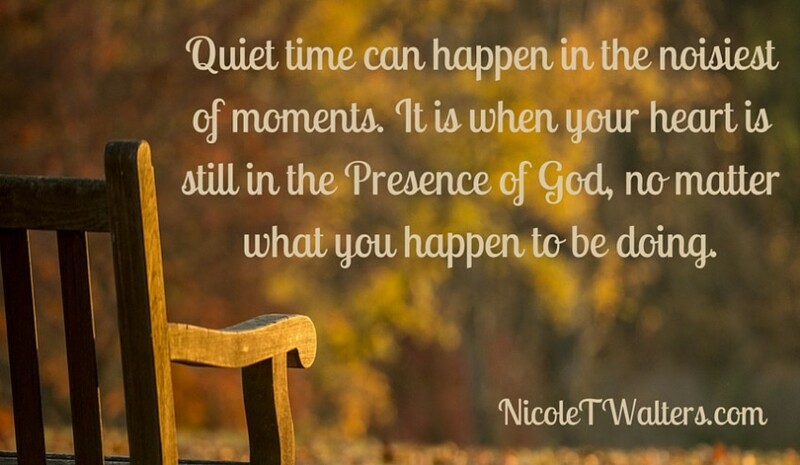 I have always aimed to have this perfect “quiet time,” thought if I could achieve this quiet space, carved out for me and God, I could have this heart that is still before Him and communes with Him throughout the day. There was a time when early morning, candles lit, I met with Him. And then, I had kids. And a full-time job. And a writing ministry. My heart started to shrivel as I held onto this ideal of this perfect quiet time that only looked a certain way. When I didn’t live up to that standard, I felt like I couldn’t hear God anymore. 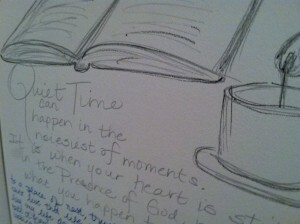 I started trying to find new ways to meet with God, outside of a Bible cracked open, a journal beside me. I was listening to Katie Orr the other day speak about this idea of a “perfect quiet time” and how it “doesn’t happen every day. It might not happen every year.” This is a beautiful podcast from a mom who is helping ladies dig deep into the Bible in just a few minutes a day but what I love most about the recording is that her kids are screaming in the background! Quiet time is when we make time to be still, not when everything falls perfectly into place. I am finding that quiet time can happen in the noisiest of moments. It is when your heart is still in the Presence of God, no matter what you happen to be doing. One thing that I have been inspired by lately is the way visual art can be such a beautiful representation of God and of what He is saying to us. My sister, an artist, sketches these creative little representations of the sermon each week on the bulletin as she hears the message preached and posts them on social media. Those little pictures stick in my mind and remind me of God’s Truths. I am no artist (my mom is an artist as well and my sister and niece got all of those genes. 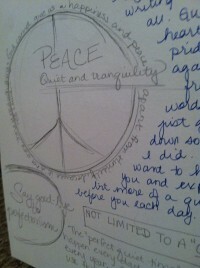 I am a dancer and writer but can’t draw a straight line with a ruler) but I am trying to sketch out things to remind me of what God is saying to me. If you feel inspired to sketch something and send it my way on social media, I will post your sketches on the weekends (words, prayers, pictures, whatever creative way you find to practice keeping a quiet heart) on the blog. 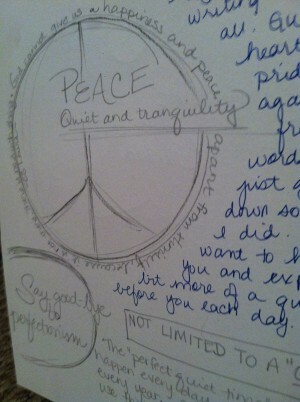 Notice this: This is day 2 of 31 Days of a Quiet Heart. 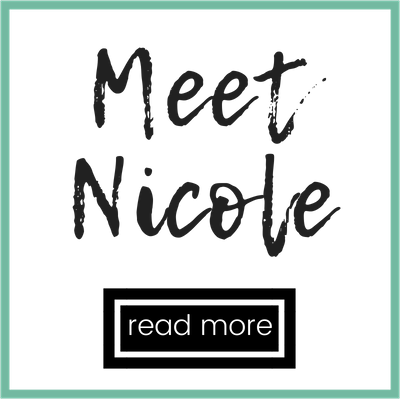 Visit the Quiet Heart page to see all the posts in the series. If you would like to receive new posts in your email inbox, subscribe now.